We wonder if the Sole F83 folding treadmill is simply one folding treadmill that Sole should tweak a bit. It’s actually a very good machine, but it falls right in between the F80 for a few hundred less and the F85 for a few hundred more. If you’re bent on saving money, you can go with the F80 without losing much; on the other hand, if you want some upgrades for just a few hundred more the F85 is your better bet. That being said, if you really have just about exactly $1,800 to spend (the usual sale price of the Sole F83 folding treadmill, you won’t be disappointed with this model at all. UPDATE: The Sole F83 never really caught on and was discontinued. Take a look at the F80 for a small step down or the F85 for a step up. Both of these machines are Best Buy recipients. 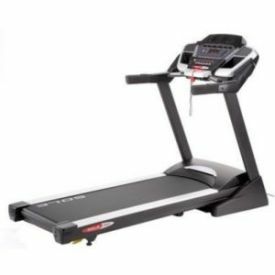 Trainers suggest the Sole F83 an excellent choice for people who want a very stable folding treadmill for walking and jogging. They hesitate to recommend it for serious runners, however, since you can get a 3.5 HP motor on the F85 for only a few hundred dollars more. They do commend the console for being “health club quality,” with scrolling message board and a ¼ mile track feature. There aren’t a lot of consumer reviews of Sole’s F83 model, but the few we’ve seen say they are satisfied. The biggest plus is the double horseshoe folding frame and safety lock, which they consider important if they have children in the house or want to routinely move the treadmill. 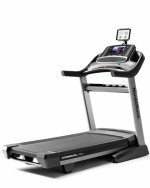 We like this treadmill; it’s a shame that it has to compete with so many other Sole treadmill models that are similar in style and features and close in price. With the Whisper Flex deck it’s one of the quietest folding treadmills you’ll ever use, but that can be said about any of the company’s models, not just the Sole F83 folding treadmill. Final verdict – decide if this is the perfect model for you, or if you want a step up in features or down in price. Any of these is a good choice.